As planter technology continues to change, it’s important to know the in’s and out’s of your machinery so you can prevent problems before they arise. Plus, a little self-education makes you your own advocate for optimal yield numbers. With this thought in mind we want you to know the inner workings of one of the most important parts of your planter: the brush meter. 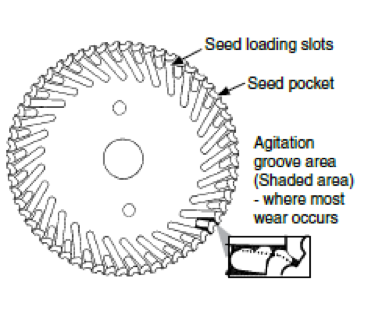 A brush meter has four main parts: The Seed Disc – This is the only moving part in the meter. It provides singulation and loads the seeds on the disc. The average life expectancy is 100 to 200 acres per row. When the disc starts to wear out the population on that row or the entire planter will plant at a reduced rate. Upper Blue Brush – The main function of the upper brush is to hold one seed in each pocket on the outer edge of the meter. The average life expectancy varies from 120 to 400 acres per row. Just like the seed disc, when the blue brush begins to wear out the population on that row or the entire planter will plant at a reduced rate. Lower Black Brush – This holds the seed pool in the bottom of the meter and starts the loading process at the beginning of the disc. The average life expectancy is 240 to 800 acres per row. The black brush’s main wear points are where the seed is loaded on the disc near the four o’clock position. When the brush is rolled over or missing, it is time replace it. Stainless Wear Band – The function of the wear band is to protect the meter housing from wear and it usually lasts from 240 to 800 acres per row. The band needs to be replaced when there is a visual groove or when the thickness is down to 0.20 inches in the main wear location. How do you know if you need talc powder? Reach into the seed hopper and cup the seed into a ball. If the seed stays in a ball, add more talc and completely mix it in. Do not use compressed air to clean out the meters at the end of the season. This will damage bristles on the brushes and could cause a need for replacement. When storing your meters, remove the seed discs to allow the brushes to relax back to their original state. If you have any additional questions about your planter or techniques for proper brush meter care, please contact your local Kinze dealer today!